Heat 1 tablespoon of oil in a pan over medium heat and add the onion. Saute until softened, then add the garlic and peppers and continue cooking for another 3 minutes. Then add the sausage and cook for about 3-4 minutes, until the vegetables are tender and the sausage is browned. Stir in the spices/bay leaf and broth. Reduce heat to low and let simmer 8 minutes, until the liquid is reduce by 3/4. While the vegetables simmer, heat the rest of the oil over medium heat in a second pan and add the cauliflower. Cook for 3 minutes, stirring occasionally until it has softened a bit but still firm. Transfer cooked cauliflower to a large bowl and add the vegetable and sausage mixture (pull the bay leaf). Mix well, sprinkle in the parsley, and season with salt and pepper. Add cauliflower rice with minced onion, egg, salt, pepper, and garlic powder to bowl - stir to combine. Heat 1 tsp. coconut oil over medium heat. Spoon the mixture into the pan as if you were making pancakes. Gently press down on each with a spatula to flatten, working to keep the latkes together as much as possible. After 2 minutes the edges will start to turn golden brown, cook for an additional 2-3 minutes after this. Carefully flip over and cook an additional 3-4 minutes to cook through. Pull from pan and season with salt and pepper. In a small bowl, whisk together all the ingredients for the dressing. Set aside. In a large bowl, combine zucchini spirals, edamame, peppers, carrots, and cabbage. Toss to combine. When ready to eat, drizzle dressing over salad and serve immediately. Add olive oil and cauliflower rice to pan over medium heat. Cook until softened (3-4 minutes). Once cauliflower is cooked add to blender or food processor, along with milk, yogurt. Process until smooth. If it’s too thick, add a little water to thin it out. In a pan over medium heat, cook butter and garlic for about 2 minutes. Add in processed cauliflower mixture and chives. Continue to cook mixture until the sauce reduces by 1/4. Remove from heat and stir in the 1/4 cup of Parmesan cheese. Garnish with additional cheese and chives. Perfect vegetarian breakfast, brunch or lunch bowl filled with veggies (yay, zucchini spirals!) and topped with eggs. In a large skillet, add olive oil, garlic, and sun dried tomatoes to pan on medium heat. Sauté until softened, about 2 minutes. Turn the heat down to medium low and gently add the diced tomatoes, tomato paste, and agave sugar. Stir until well-incorporated. Whisk in the Greek yogurt, slowly, and mix well. After all of it has been incorporated, bring the heat up to medium high and let it simmer and thicken for about 5-7 minutes. Season the sauce with salt and pepper, to taste, then add in the spinach. Once the spinach has wilted, add in the zucchini spirals and let soften (2-3 minutes).If the sauce seems too thick, add some water. Garnish with crushed red pepper flakes. 1. Heat tablespoon of olive oil over medium heat in large pot. Add diced onion, garlic, and bell pepper and cook until softened (3-5 minutes). 2. Increase the heat to medium-high and add ground beef. Break up into crumbles and cook through (5 minutes). 3. Add the remaining ingredients and let simmer for 60 minutes (up to 3 hours). 4. Portion out in bowls and garnish. 1. Heat 1 tablespoon of sesame oil in a pan over medium-high heat. Cook and stir chicken or pork in hot oil until lightly browned on all sides and cooked through, 5-7 minutes. Transfer meat to a plate. 2. Heat remaining 1 tablespoon of sesame oil. Saute garlic in hot oil until just softened and add cauliflower; cook and stir until cauliflower is tender, 4 to 5 minutes. Add 1/4 cup of chicken stock halfway through. 3. Crack in egg and stir until cooked through. Last add in cooked chicken or pork, soy sauce, and, frozen peas carrots. Cook for another 5 minutes till everything is warmed through. 4. Garnish with green onions and sesame seeds. 1. Add cauliflower rice, kale, dried cranberries, green onions, and pumpkin seeds to a bowl and mix together. 2. In a separate, small bowl, whisk together the olive oil, balsamic vinegar, and garlic. Pour over the salad and mix well. Add salt and pepper. Note: This actually gets better with time so make ahead and store in the refrigerator at least 2 hours (all the way up to 24 hours) before eating. 2. Add warm cauliflower rice to food processor along with garlic, butter, and salt. Process until mixture is smooth, adjust seasoning as needed. 1. In a bowl or food processor, add all of the ingredients for the dressing except for the olive oil. Slowly add in the oil and whisk/pulse until the dressing comes together. 2. 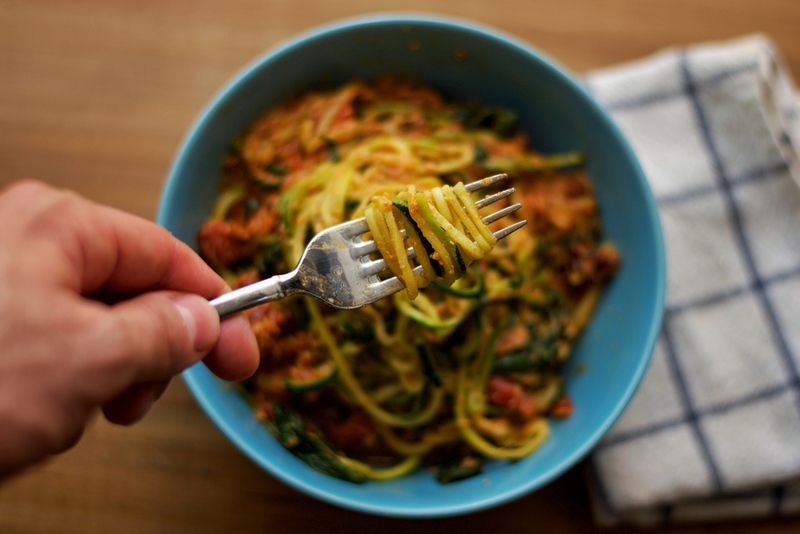 In separate bowl, add the Zucchini Spirals, cherry tomatoes, and artichoke hearts. Pour in the dressing and mix everything together. 3. Right before serving, garnish with some crumbled feta cheese. Serve cold or at room temperature. 2. Add the shallot or onion and garlic. Cook over medium heat for 1-2 minutes until softened. 3. Add the mushrooms, salt, basil, and pepper, and cook for 3-5 minutes until the liquid from the mushrooms has evaporated. 5. Add carrot spirals and stir together. Let everything cook for another 3-5 minutes until the spirals are done to your liking. 2. 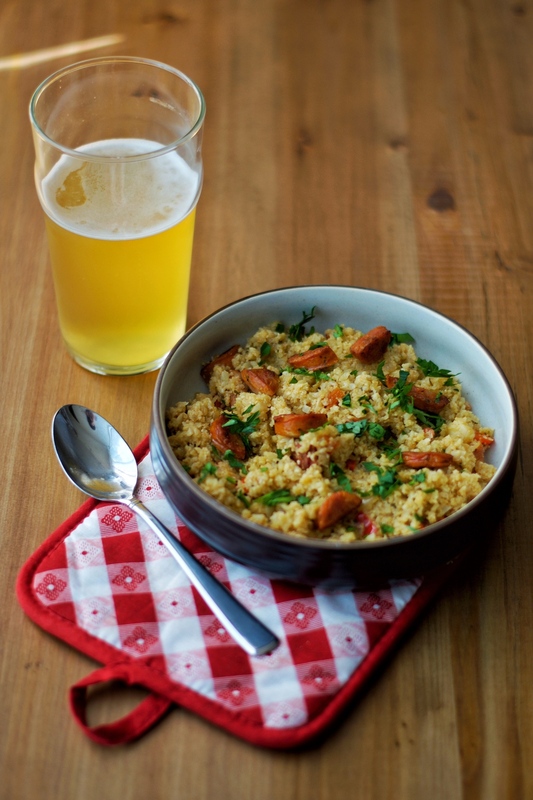 Let cauliflower rice cool and add to food processor along with all other ingredients. Process until mixture is smooth, adjust seasoning as needed. 1. Melt butter in a large skillet over medium high heat. 2. Add shrimp, garlic, and red pepper flakes. Stiring occasionally, until shrimp is cooked, about 2-3 minutes. 4. Add zucchini spirals combined with sauce and heat through, about 2-3 minutes. 5. Garnish with parmesan and parsley. 1. In a large saucepan, heat one tablespoon of oil over medium heat. Then add in the broccoli and cook for 3-5 minutes until broccoli softens and turns bright green. Remove broccoli from pan and set aside. 2. Add the other tablespoon of oil to pan and heat to medium. Add the onion, garlic and ginger and cook for about 3 minutes or until onion becomes translucent. Next, add in the green curry paste and stir continuously until paste covers the onions. Next, add coconut milk and cook for about 2 minutes until bubbling. 3. Lower to a simmer and add in the broccoli back in. Cook the mixture for 5 minutes and then add in the lime juice, fish sauce, carrot spirals, and salt and pepper. Cook for another 5 minutes or until carrot noodles are cooked to your liking. 4. Sprinkle chopped cilantro on top and serve. 1. Empty bag of joyloop cauliflower rice into microwave safe dish and heat until cauliflower is cooked through and softened (3-5 minutes on high). Empty dish into a cheese cloth or dish towel and ring out the moisture. 2. Let cauliflower rice cool completely then add to large bowl with other ingredients. 3. Preheat oven to 400. Grease baking sheet and spread mixture evenly across it. Bake for 10-15 minutes or until golden brown. Cut into sticks and serve. 1. Put all the ingredients, except the carrot spirals, into large bowl and mix together. 2. Add carrot spirals to sauce and gently mix until evenly coated. 3. Add garnish and serve cold or at room temperature. 1. Combine the basil, garlic, nuts, and lemon juice in a food processor and pulse until coarsely chopped. Slowly add the olive oil in a constant stream while the food processor is on. Stop the machine and scrape down the sides of the food processor with a spatula. Add the lemon juice and Parmesan cheese. Pulse until blended. Season with salt and pepper (the flavors really develop if you let it sit in the fridge for a few hours so make ahead, if possible). 2. Add pesto to a pan and bring to medium heat. Toss in the 1/2 cup of cherry tomatoes so they can soften (2-3 minutes). 3. 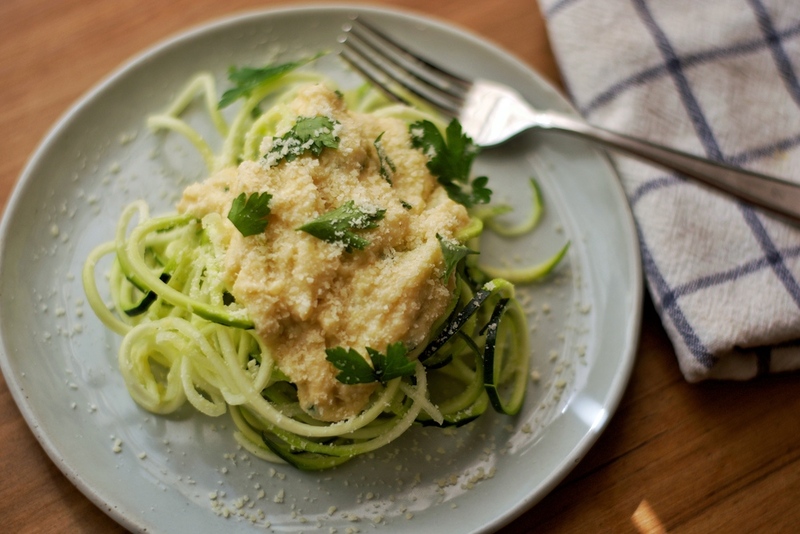 Combine the zucchini spirals and sauce for 3-5 minutes until zucchini softens and is cooked to your liking. Top with some additional parmesan cheese and serve. Note: This could easily be served cold instead. Just toss pesto and tomatoes together with zucchini spirals and store in fridge. 1. Add beans and broth to food processor and puree until smooth (30 sec) and set aside. 2. Add olive oil to a large pan and heat on medium-low. Add mushrooms and onions. Cook until onions are soft and mushrooms are lightly browned (about 5 min.). Add garlic, salt/pepper, and lemon juice and increase heat to medium-high. Continue cooking until almost all the liquid has evaporated. 3. Add bean puree to the pan and bring to a simmer. Stir in the cauliflower rice. Reduce heat to medium, cover the pan, and cook, stirring occasionally, until cauliflower is tender (5-7 min). 4. Uncover the pan and turn off the heat. Add the cheese and parsley and stir until combined. Drizzle with truffle oil and serve. 1. Heat 1 tablespoon of oil on medium heat in a stock pot. Add garlic, celery, and onion and sauté until softened (2-3 minutes). 2. Pour in chicken broth and bring to a gentle boil. 3. Add zucchini spirals, carrot spirals and chicken, cook for 3-5 minutes to soften spirals and heat chicken. 4. Add fresh herbs and simmer until fragrant (another 3-5 minutes). 5. Season with salt & pepper. ©2018 Joyloop Foods LLC. All Rights Reserved.